If one was to watch only the first hour of the latest film from Dan Trachtenberg 10 CLOVERFIELD LANE they may be a tad bit confused. 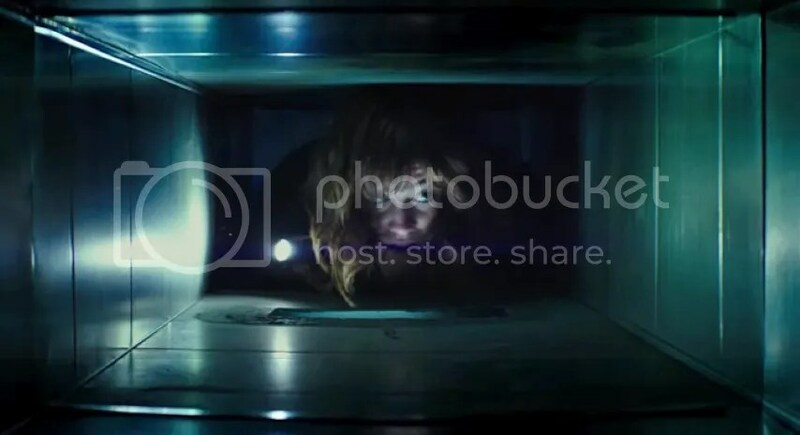 This film is loosely based off of CLOVERFIELD but further research will tell you that the plot actually came from a short story called THE CELLAR. In the movie we meet a young woman who is being held hostage by a man who is more than prepared for the end of the world. The good thing for him is it is actually happening. There is also another man who is trapped with them that puts a nice little hitch in whatever plans the captor has. While the world may or may not be crumbling outside tensions and paranoia rise and we come to a point of wondering if there are more dangers inside then there are out. You will hear the words slow burn, mind numbing pace, etc as words to describe 10 CLOVERFIELD LANE. They are all spot on as it is really more of a character based thriller with a lot of dialogue and a few “what if” moments. John Goodman is brilliant as “Howard” the overly sensitive bludgeoning man who seems to be holding his two hostages on his every whim. He gives real and believable equity to his role. The main thing the viewer will find themselves debating is if he is telling the truth or not. For a survival style of a film that serves good purpose as you truly feel you are locked in the bumper. Unfortunately with the chaos that ensues in the end it makes the set up a little less than desirable. We are watching two films in one here with 10 CLOVERFIELD LANE. One is a psychological thriller while the other is an all out sci fi assault. This dynamic will undoubtedly hurt the ratings of 10 CLOVERFIELD LANE as many people will leave having no idea of what they just watched. So there is some good and bad when watching 10 CLOVERFIELD LANE. The good is the performance by John Goodman and the crazy antics he displays throughout. The bad really just revolves around the rush felt ending that while becomes understandable to the rest of the concept is almost a clear 180 in regards to execution. If you are into tension building thrillers filled with conspiracies you will love the first half of this film. For most they will snooze past all this trying to make a connection to the actual CLOVERFIELD leaving a sour taste on a story that actually carries some merit. 10 CLOVERFIELD LANE is directed by Daniel Trachtenberg and stars John Goodman, Mary Elizabeth Winstead and John Gallagher Jr. It is now playing in theaters everywhere.